Los Angeles – Gold bullion prices finished the week down by a mere 0.08 percent at $1,428.10 an ounce while the price of silver finished the week higher by 1.26 percent at $37.77 an ounce and the Gold/Silver ratio fell to 37.81, its lowest in over 13 years, as silver continues to grow more expensive relative to gold. Over 40 foreign ministers and representatives met last week in London and agreed to continue the NATO-led air strikes against Muammar Gaddafi’s Libyan forces until Gaddafi complies with the current U.N. resolution calling for an end to all violence against civilians. In Syria, President Bashar al-Assad mobilized tens of thousands of Syrians in mass pro-regime rallies across the country and gave his first speech since the Middle East unrest began in which he addressed “the internal issues and the latest occurrences,” in his country. The Syrian president also accepted the resignation of his government while the United States is offering free flights out of Syria to families of U.S. government employees, reported by the State Department on Sunday, as violence in the Middle East boosts precious metals’ safe-haven appeal. Congressman Ron Paul [R-TX] has just introduced the Free Competition in Currency Act of 2011, H.R. 1098, in the United States House of Representatives. With this legislation, Congressman Paul is seeking to end all taxes charged by federal, state and local governments on gold and silver coins and bullion. The bill would eliminate capital gains taxes on gold and silver coins as well as sales taxes charged by state and local governments on all coin and bullion transactions. Current “legal tender” laws, which Paul considers unconstitutional, would also be repealed by passage of H.R. 1098. 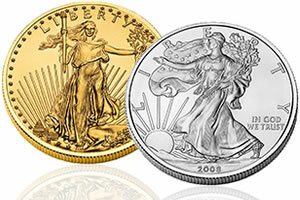 American Bullion specializes in adding gold and silver to retirement accounts. If you have a question or would like to know more about your investment options, please call American Bullion at 1-800-326-9598 to speak with a precious metals specialist.